The #MeToo movement, simmering in social media for over a decade, boiled over last fall with Alyssa Milano’s famous tweet: “If all the women who have been sexually harassed or assaulted wrote ‘Me too’ as a status, we might give people a sense of the magnitude of the problem.” Now two GCC students, Sequoia Lebreux and Lu Vincent, have brought this movement to campus by creating the GCC #MeToo board. On display in the East Building, the board announces its purpose: “…this is a movement with the intention of creating solidarity and visibility for survivors of sexual assault and harassment.” A panel discussion on February 15th will take this another step forward on our campus. The event will be held in the Stinchfield Lecture on the Main Campus, 11 a.m. to 12:30 p.m. The path to creating the board and panel began last fall when Dean of Humanities Leo Hwang and Professor of Sociology Linda McCarthy convened a student group called Collective Voices, Common Ground to provide a forum for discussing current social issues and bringing together students interested in activism on campus. Out of the many issues raised, #MeToo emerged. Then Lu and Sequoia got to work. 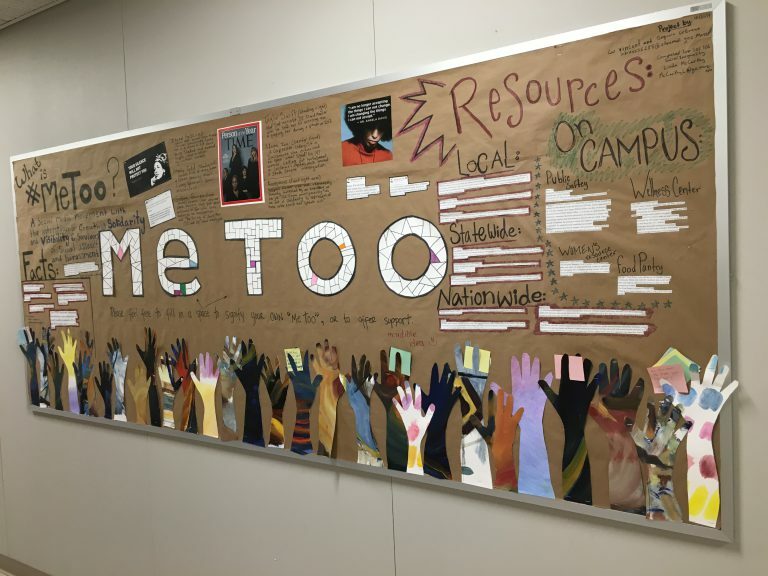 Combining their passion and talents and supported by the art department, the #MeToo board is a visual representation full of color and content, with bold lettering and beautiful cutouts of many hands and an interactive component where you can leave a message by tucking it between outreaching fingers. It all came together organically to explain the movement, provide resources, educate and promote expression in a lively and accessible way.